Posted by IaninSheffield in research, Teaching Idea. Our Year 11 students are drawing their AQA Level 2 Projects to a close, so as they write their reflections I thought it might be an opportune moment to ask them about their experiences. I spent a few minutes with the eight or so who kindly volunteered their time; the audio interviews can be found on the SHS ‘Look Who’s Talking’ blog, but here I’ll try to provide a synopsis. As might be expected, some settled on a topic quite quickly, already having an idea in mind. Others needed a little more prompting, but the sources from which they drew their inspiration were varied and included books; their supervisors; lessons and subjects; news and magazine articles and the arts. During the course of their studies they enjoyed the sense of freedom the Project provided, whether in being able to follow a subject about which they were passionate, being able to work in a way and at a pace that suited them, being able to delve more deeply into a topic than was usually possible or having a choice about the way they could present what they had learned. Even writing an essay became more fulfilling since it was on a topic about which they cared and they had carte blanche in the contents and format. Although presenting to an audience caused some measure of stress and induced nervousness in some, having the chance to share your findings proved particularly rewarding, as did working with a teacher on a ‘more equal footing.’ Several reaching the end when the sense of achievement became palpable since it represented the culmination of so much effort over such a sustained period. …to be your own boss and learn what you wanted to learn freely and not have to stick with the curriculum. Certain aspects of their study came to them less easily and proved tough to overcome, like time-management, the apparent mountain of work, making sense of an abundance of information and overcoming issues with lack of motivation. Yet the interviewees recognised that meeting these challenges provides benefits they would carry forward either into the next years of their education or across into other subjects they’re currently studying. They had become more committed to managing their time, working to deadlines and had become more self-disciplined. They noted how much better they had become at constructing an essay in other subjects and that the strategies they used to form an argument had improved. Their self-confidence, patience and persistence had all been boosted, reassuring them of their capability to work independently. Although no questions in the interview asked how technology had been employed in their Projects, several comments suggested how integral it had been to their success, yet made no song and dance about it. To the students, it was just one of the tools they used and so perhaps provides evidence for the degree to which technologies are increasingly embedded? The Internet clearly played a big part, providing access to information (and people!) they might otherwise not have been able to access so readily. However this was often done using more sophisticated techniques than are commonly employed e.g. Google Scholar, Google Books, using advanced search terms and searching YouTube. It’s all very well to bemoan the ease with which students have access to information through the Internet, but if that information is not available in their school or public libraries, then the Internet might indeed be the only option available. In thinking what we might learn from these observations, I wonder to what extent the outcomes can be extrapolated to our other students and their studies? Those who signed up for the Project are largely well-motivated, capable learners who clearly rose to the challenges they faced; would all students be capable of doing so? Would they want to? Using real-life problems to motivate students, challenging them to think deeply about meaningful content, and enabling them to work collaboratively are practices that yield benefits for all students. David, J.L., 2008. Educational Leadership:Teaching Students to Think:Project-Based Learning. Educational Leadership 65, 80–82. Posted by IaninSheffield in Management, research. The Pupil Premium is one way in which the Government is attempting to address educational inequality. We know a good education is the key to improving young people’s life chances, to enable them to progress into adulthood with the skills and confidence for success. The Pupil Premium will provide schools with the resources with which to address inequalities in the system and raise the attainment of those pupils from low income families. I was having a look through the Pupil Premium Toolkit, commissioned by the Sutton Trust, which seeks to guide “teachers and schools on how best to use the Pupil Premium to improve the attainment of disadvantaged pupils.” By reviewing educational research, the toolkit compares different strategies used to improve pupil attainment (Assessment for Learning, One-to-one tutoring etc); exploring impact, cost and the strength of the evidence. You’ll see from either the online version or the downloadable PDF, that the information on each intervention is presented first in a summary, then subsequently in more detailed form. I got to wondering which approaches might be most cost-effective in terms of greatest gain per £ – not a difficult calculation to do and mere moments of effort to produce a spreadsheet. But then I thought how we might also factor in the strength of the evidence; after all would it be wise to spend money on an approach producing a high attainment gain per £ if the evidence which suggested that approach isn’t quite so robust? Gain in attainment on the horizontal axis, cost on the vertical and width of bubble indicating the strength of the research which produced the findings. So the sweet spot is the bottom right-hand quadrant where we get high gains for low (moderate?) cost. And what do we see? Providing effective feedback, meta-cognitive strategies, peer tutoring and homework (?!) all figure prominently. 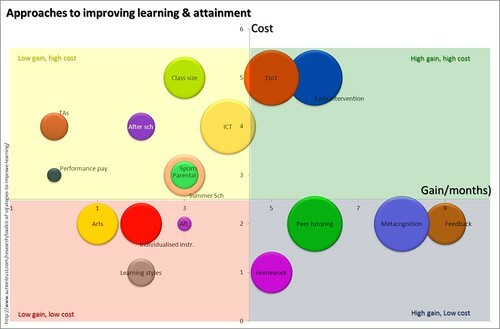 Sadly, ICT only produces moderate gains and at a high cost … but there’s a whole other post could come from that! Does that reflect your day-to-day experience though? Amazon’s recent release of new versions of the Kindle finally tipped me over the edge and I shelled out £89 for the Kindle 4. Having never Kindled before, I was going to write a detailed review … but of course, that’s ground that has been well ploughed elsewhere (T3, Reviews eBook Readers & TechRadar). So what is there to add? Well after just a week’s use, let’s move past the functions and features and look at what this pocket-sized wonder has done for me. I read books and it let’s me do that very effectively, though it also lets me add highlights, bookmarks, clippings and notes. Further still I can share some of those annotations with the wider world and can check out what others are ‘posting.’ Given that in addition to sharing notes with the public at large, you can also ‘follow’ people of your choosing. That set me wondering if there was any mileage in Language Arts or Librarian colleagues being able to have students ‘share’ their reading experiences with one another? Of course that can be done in class or through a book club, but surely the asynchronous opportunities present an affordance not available from paper-based media? Perhaps surprisingly though, reading books was not my first consideration in getting a Kindle. It was more about the chance to read journal articles, research papers and even blog posts at a time and place to suit. 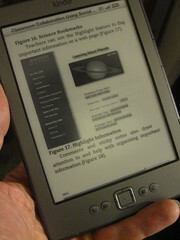 Getting PDFs onto the Kindle couldn’t be easier really. I can either plug it into the computer with the USB cable (supplied) and drag and drop the files into a folder on the device, or rather interestingly I can email them direct to my Kindle account, which then synchs those files. To get blog posts across, I have been using an online service called SENDtoREADER (registration required, but free) which provides a one-click bookmarklet to send any web page direct to the Kindle – easy-peasy! So barely a week in and I’m loving the ease of use, from both the reader and user perspectives … and there’s still plenty more to explore!